I had a visit from Jean-Louis Locas. Jean-Louis is the bass player with Cirque Du Soleil who are performing their show “Kooza” at the Royal Albert Hall. Jean-Louis has in his arsenal of instruments a beautiful 5 string bass by Sadowsky. The bass was in need of a quick set-up and a little fret attention mid shows. Cirque du Soleil tour with a 5 piece band where the musicians double-up on instruments . It’s made up of bass, guitar, keyboards, drums, percussion and a horn section. Circus of the Sun is in town! 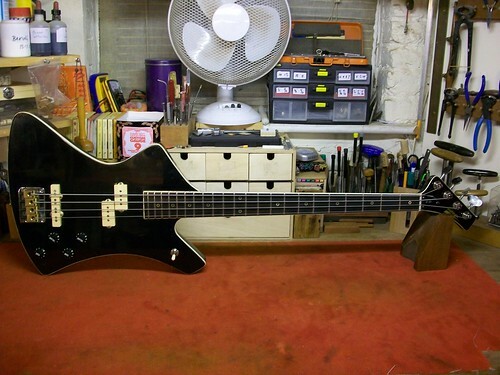 One of my regular customers, and a collector of rare and unusual bass guitars, bought this Vintage Washburn B-20 bass into the workshop. He had hoped that it might be resurrected. 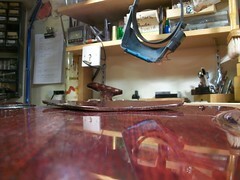 All in all it was a mess, after a workbench examination it became clear that most of the jobs were doable but there was one nagging problem, there was an extreme split to the back of the neck. 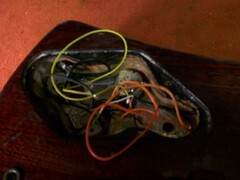 A major worry as this meant that this guitar was destined for the scrap-heap if this couldn’t be resolved. 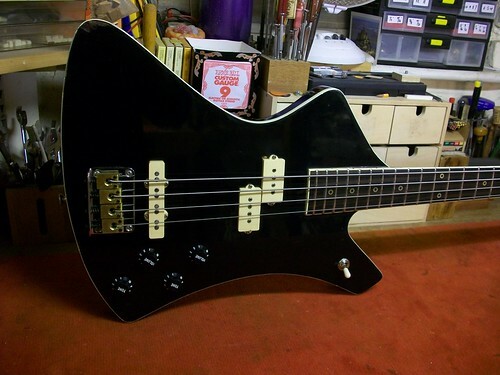 It appeared that the truss-rod was trying to burst out through the back of the neck. This truss-rod problem could have been due to: (1) Faulty manufacture or material (2) A sudden shock to the back of the neck (3) A fault with the playing action that necessitated the truss-rod being tighten beyond its limit. Whatever the reason I needed to investigate further. 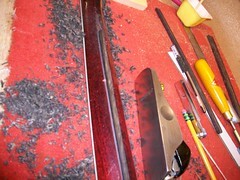 After a quick test I discovered that the adjuster was locked as tight as possible but the neck was in an upward bow. 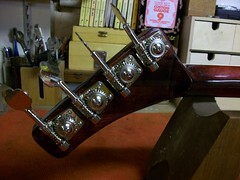 It was the truss rod type that adjusted with an allen key and it showed signs of heavy use. 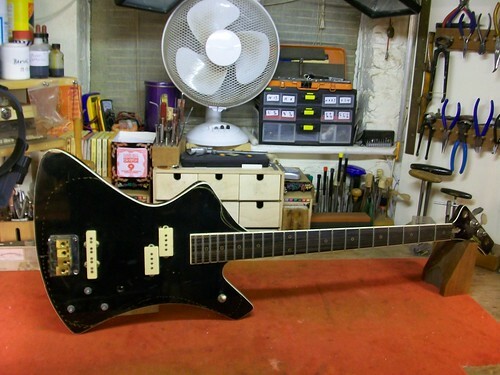 Another test would have been to string the guitar up, slowly bring the strings up to concert pitch and to check how the neck responded, but that was not possible as two of the machine heads and the nut were missing. 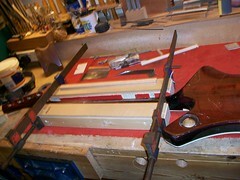 I decided to make an extreme adjustment test to the neck and truss-rod. Using a heavy-duty straight-edge, blocks of wood placed at either end of the neck and a clamp at the centre of the straight-edge, the neck was gently forced back into a back bow. 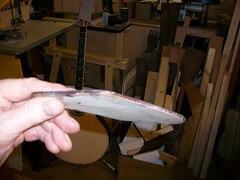 This took the strain off of the truss rod and held the neck in a back bow. With the truss rod under no pressure from the neck I was able to tighten the adjuster further to hold the neck in a back bow with the truss-rod. The splits seemed no worse for this action. 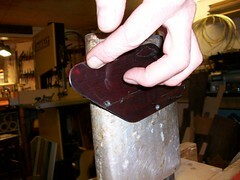 The finish around the Mahogany insert was scraped back and the cracked insert routed out. This left a straight and clean channel for the replacement. This was to be a piece of ebony because of its strength and density (taking no chances here). 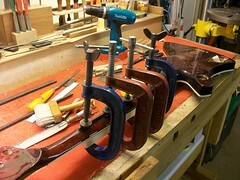 As well as the neck repair here is a list of jobs that were carried out to bring this old War-Horse up to playing spec. 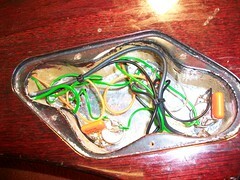 The pickups were working but the electrics were in a mess, components missing, bad solder joints and the components that were present were cheap and nasty. 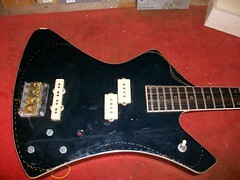 All pots, caps, 3-way toggle, jack socket and wiring were replaced and the pickups were giving a complete overhaul. New machine heads were sourced and bought in. The Finish probably seemed worse than it actually was. 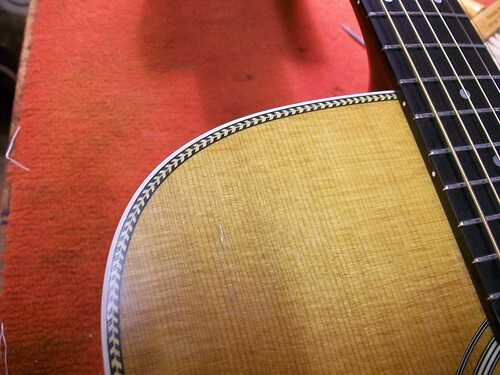 The guitar’s top and back had what seemed like lines scratched into its surface. On closer inspection these weren’t scratches at all but gold pen and would probably polish out. Was someone, somewhere really considering cutting along these dotted lines?! There were many scratches and knocks all over its body. Although many of these would never polish out the owner resign himself to the guitar showing its “battle scars” and thought that it would probably look quite cool once the pen marks were removed and the finish polished up. The last job was on the electrics back cover. This had curled up like a stale sandwich and would never go back into place without some attention. I used my rib bending-iron and applied a little moisture and heat. 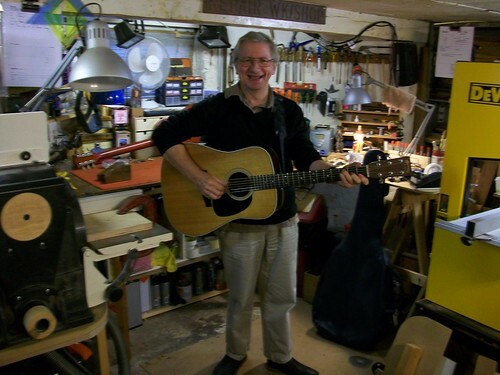 This Martin HD 28 is in the workshop for a full set up and fret dress. It dates back to 1987 and this is its first serious set up. 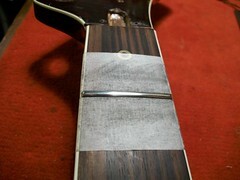 The frets are showing signs of wear and tear. Also the fingerboard has started to show signs of wear and has a few grooves worn into it around the lower end on the treble side. The fingerboard wear is tackled first. 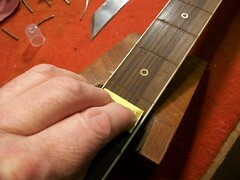 It is skimmed between the frets and the worst of the grooves filled and smoothed. 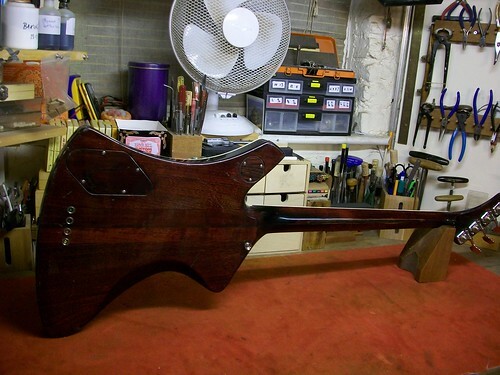 Next comes the fret dress. 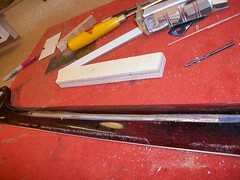 The truss rod is released to ensure that the fingerboard is flat and level. The neck is supported along its length. The body work is protected and masked off. 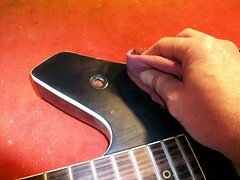 The fret tops are skimmed with a fine honing stone to remove all fret wear and grooves. 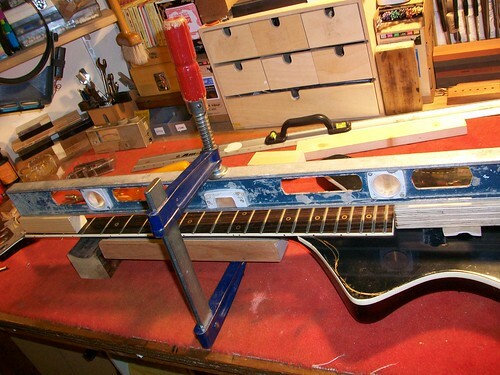 Also to ensure all frets are a uniform height. 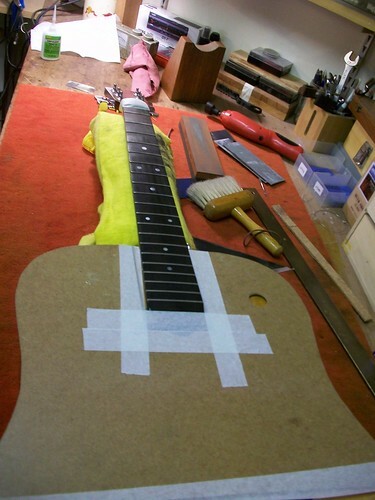 The fingerboard is masked off. 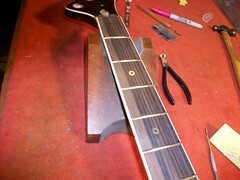 Each fret is re-profiled. 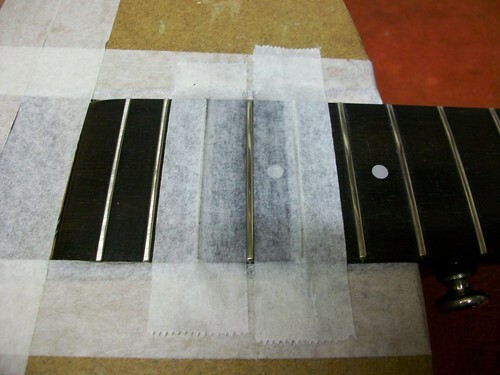 Each fret is polished up to 2500 grade Silicon Carbide paper and then finely polished with burnishing cream. 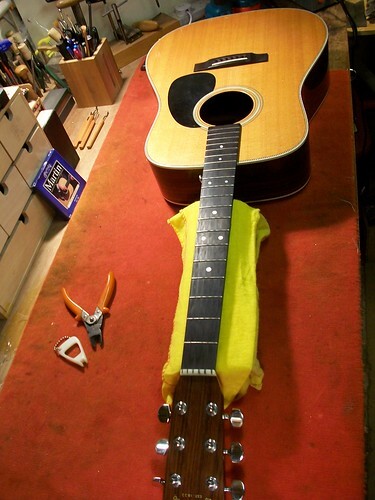 The guitar is strung up and the truss-rod reset for Martin medium gauge strings. And it plays like a dream. Meet Colin the happy owner. Fizzing and buzzing is an expression I like to use to describe annoying fret rattle. 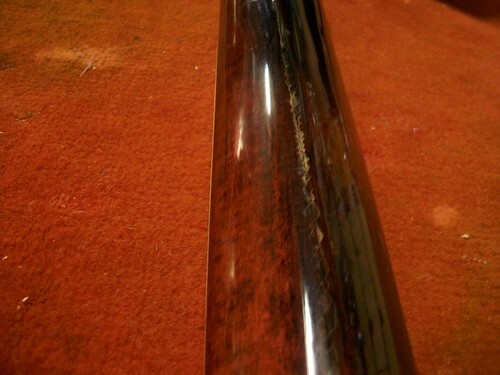 It can be caused by several factors and will compromise the playability and sound of the guitar. An action that is too low. This would be remedied by raising the action at either the nut or the bridge-saddle. 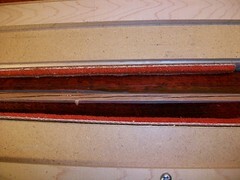 Uneven fret wear along the fingerboard. 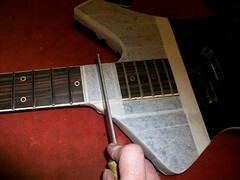 This is a general wear and tear problem and is solved by honing the fret tops to a uniform height and then reprofiling the frets to recreate the correct shape. 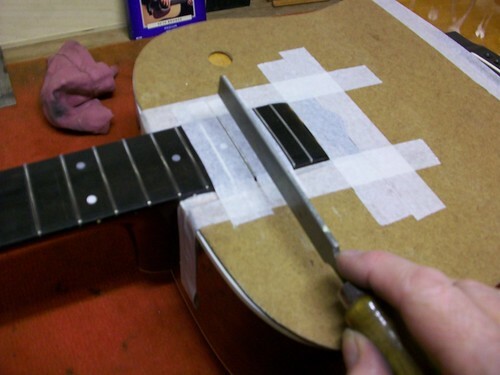 This process can be repeated several times before the frets have to be replaced. Does your guitar have annoying fret rattle? 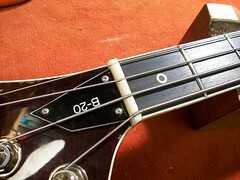 Fret buzz or fret rattle is annoying and can be caused by several factors. It will compromise the playability and sound of your guitar if left unchecked. 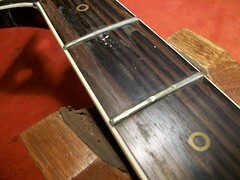 Uneven fret wear along the fingerboard. 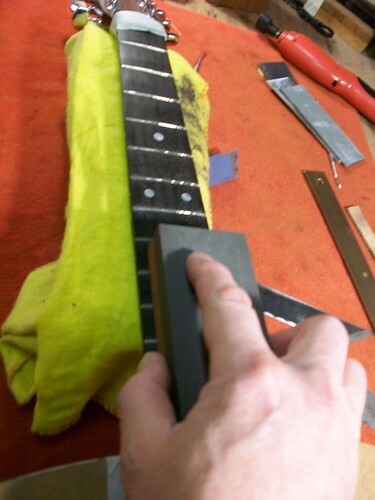 This is a general wear and tear problem and is solved by honing the fret tops to a uniform height and then reprofiling the frets to recreate the correct fret shape. 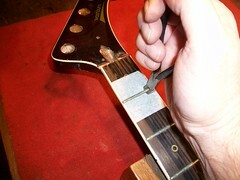 This process can be repeated several times before the frets have to be replaced.